Have you ever felt so much stress in the world that all you wished was a little me-time? 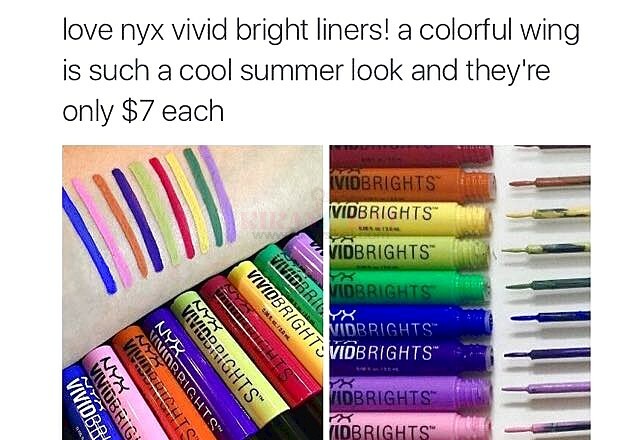 Well, V&M Naturals and Benibana Beauty Hub got our wish granted! 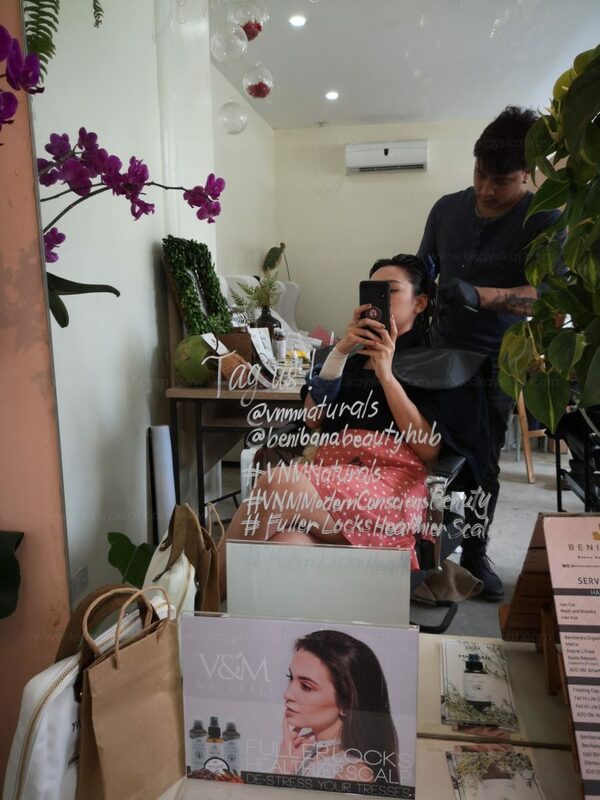 Last week we were treated for a quick hair pampering session using the extensive specialty hair care line from V&M Naturals. 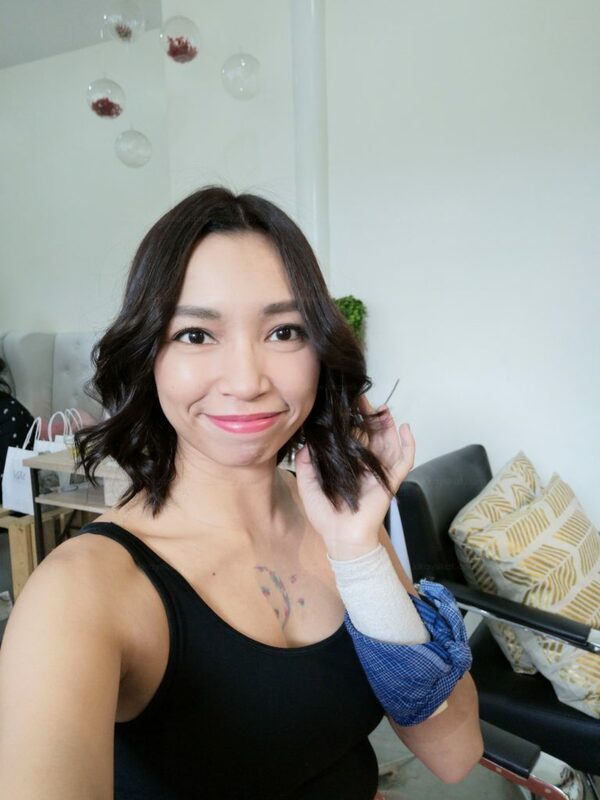 As you all know I recently cut my hair short because I was sick and tired of all the split-ends and damage all my hair bleaching and hair coloring has caused. So I’m excited to start fresh, with a new hair care routine. My hair type is thin, frail, and a bit greasy. Continue reading below to see what I’m talking about. 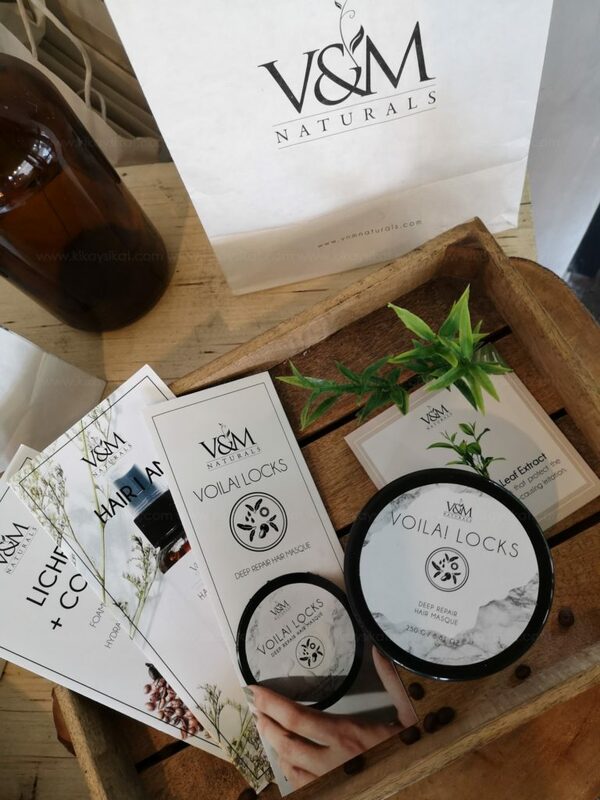 V&M Naturals is dedicated to working hair miracles without using any harsh chemical components, as the brand uses only the best natural ingredients sourced locally and internationally. Their potent formulas are not just gentle on the hair, they also provide better results the longer they are used. The Lichen + Coffee Shampoo and Conditioner duo properly cleanses the hair without stripping all the good oils. This is all thanks to the powerful combination of actives from Lichen and hydrolyzed Silk that protect the strands from free radicals and irritation. Other ingredients like Yogurt protein, Emu Oil, and Coffee Seed extracts not only prevent dandruff, they are also detoxifiers that stimulates collagen production and acts as an invisible shield against UVB rays. The strands get stronger, healthier, hydrated, and more manageable with prolonged use. 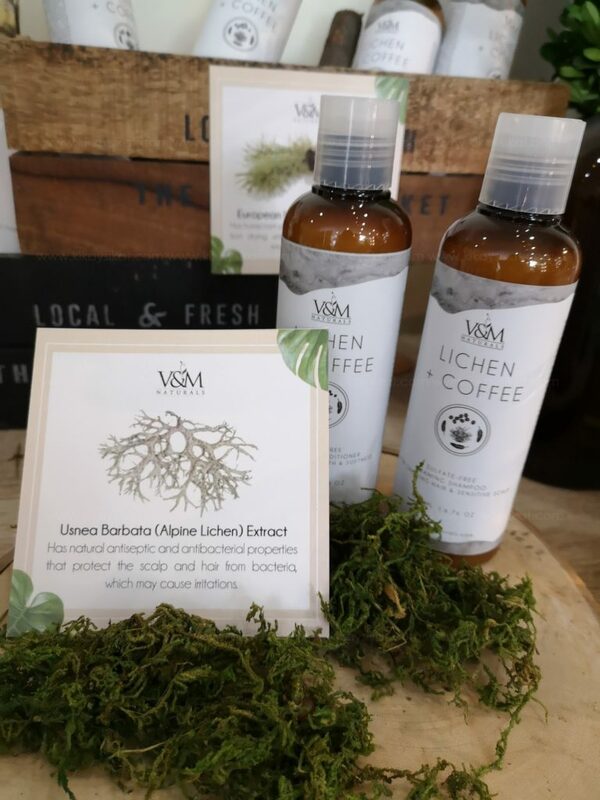 The Lichen + Coffee Shampoo is priced at P 750.00 while the Lichen + Coffee Conditioner is at P 850.00. Kikaysikat says: It smells like fresh apples! Not coffee! So good and refreshing! The shampoo lathers up very well and both made my hair soft right after use. My one qualm is that the conditioner is hard to dispense/squeeze out from the bottle because of its thick consistency. Damaged hair that needs special care will be able to get the repair and life it needs with the Viola! Locks hair mask. This is a deep repair mask that is a 5 – 7 minute treatment. It targets the damage caused by chemical treatments and heat styling while reconstructing the hair.Ingredients like Coconut Oil, Keratin, Argan Oil, Emu Oil, and Alpine Lichen extract help revitalize the hair and bring it back to its healthy state. The Viola! Locks Hair Mask is priced at P 580.00. 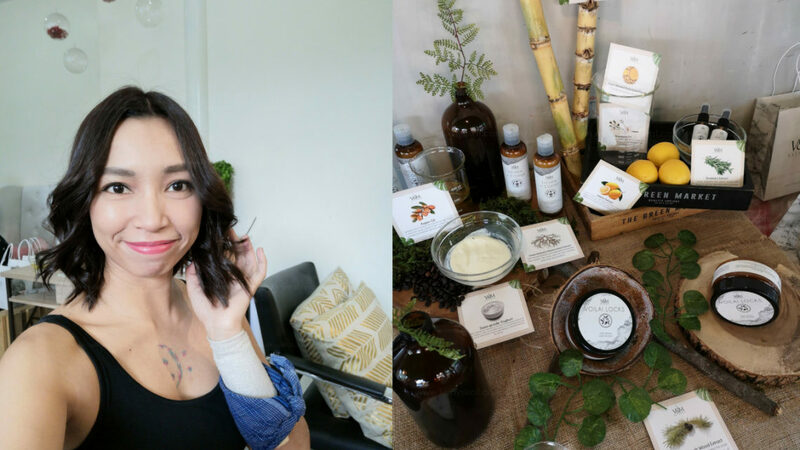 Kikaysikat says: It’s a deep repair treatment you can use every week. I like that it’s in a tub and is very very emolient. The instruction says you need to rinse it off, then use the Lichen Coffee Conditioner to seal it in. Fuller and thicker hair is just a spritz away with Hair I Am. 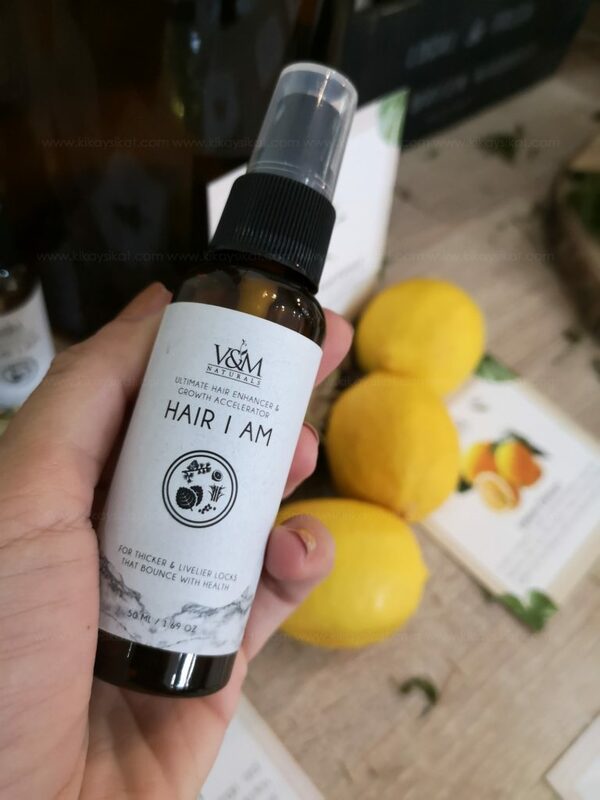 It is a light formula that goes on the hair after wash and is formulated with nourishing ingredients like Green Tea, Rosemary, Perilla Leaf, and Chameleon Plant to improve weak follicles. It is incorporated with Coffee and European Larch Wood, which helps with hair growth and a soothing sensitive scalp. There is also Lemon and Sugar Cane that refreshes the scalp, and adds volume to each strand. The longer the booster is used, the better and healthier the hair gets, as there will be increased luster, smoothness, thickness, and softness. Brittle, dull, and damaged hair will be a thing of the past with this travel friendly product! 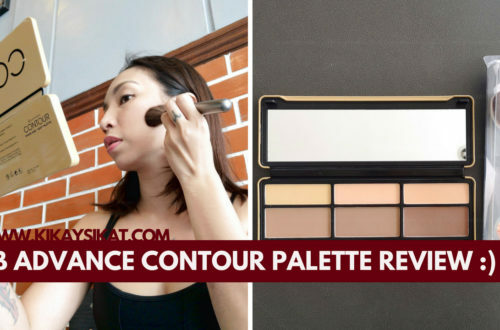 Kikaysikat Says: If you’re low on budget and want to invest in one product, I highly recommend this one. I love using it before going to sleep together with my Hua Mulan Wooden Comb. I spritz 3-4 sprays focusing on my scalp then massage it in. It claims to targets all of my hair’s weaknesses like brittleness, damage, and volume. The salon is located at #187 N. Averilla St. Barangay Sta. Lucia, San Juan City. For more information, visit the Benibana Beauty Hub Page.